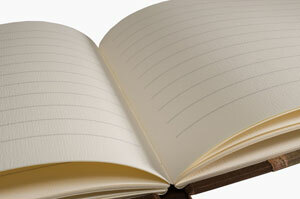 Our Guest Books are hand made from the finest materials. We use paper and book cloth from all over the world to create a unique and beautiful book. The interior is an 80# warm white text paper with a deckled edge that has an elegant felt finish and the wonderful look and feel of handmade paper. Our paper is archival and chlorine-free. We hand sew our book blocks so that our books will lie open flat. 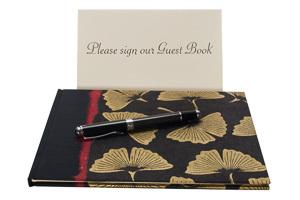 This Guest Book is available with Lined or Blank pages. We print the pages with soft gray lines spaced 1/2" apart. The book measures 8 13/16” x 6 7/8” and is 5/8” thick. It is available with 92 or 188 pages. Consider adding a name and date to a Wedding or Memorial Guest Book. We can personalize the title page of any book by printing a name, date, quotation and even a picture. We custom design the colors, text styles, and layout to your specification and send you proofs in PDF form for review, correction and approval. We can also include a matching tent sign that can be placed near or behind the book to encourage guests to sign the book. If you like a personalized title page, please select a font, color and enter your text (along with any special instructions) in the product page. If you like us to print a picture, let us know, and we will follow up with you in email.